After opening 5 packs of this product I must say this is a better looking base set than I have seen from Topps in previous years. The last 2 years did nothing for me, although this one looks like a vintage 90's set design with a slight modification it's much improved over years past. In 4 packs, I got 4 Topps Town, 1 Gold Topps Town, 1 Gold Parallel (Johan), 1 Turkey Red (Longoria), and 2 Legends of the Game (Gehrig). For retail packs that isn't terrible, plus I got some base cards for my personal collection. So far the packs are fun, but this is making my mouth water to crack that case. 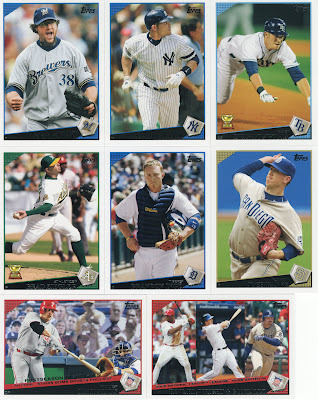 I probably will only scan any parallels I get from the remaining packs since you can see the design from these scans, and it will get pretty boring. 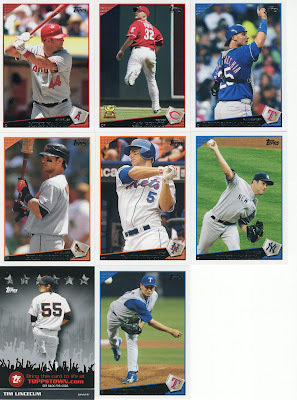 My rookie binder got a couple of new cards out of this, a couple of Jay Bruce and a couple of Longoria. One of the more fun cards was the Pudge card because he is in a Yankees uniform and even though his career there was short lived, he is still one of the games great catchers. Pack 5 has been my favorite. You already know why with out even seeing a picture I'm sure. This was also in the same pack. 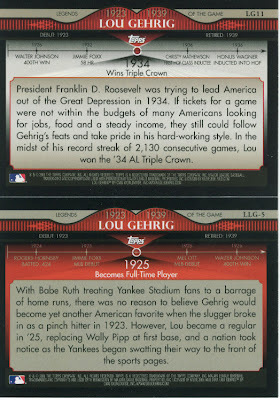 Back of the Gehrig cards, by request. Poor Gorzelany got the "keep your head down" treatment to keep from scaring the kids buying Topps. Not a terrible five packs. Can't wait to see your case. Good luck! 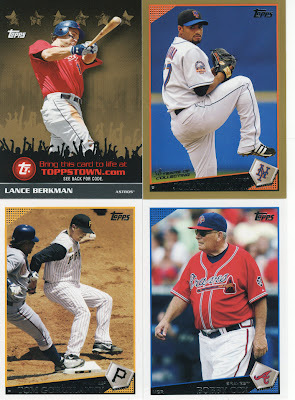 It appears Topps may have listened to some bloggers. The photography in this set appears at first glance to be dramatically better than in 08. That's a pretty sweet lookin' Turkey Red Longoria. Oh wait. No base in Series 1. Never mind. 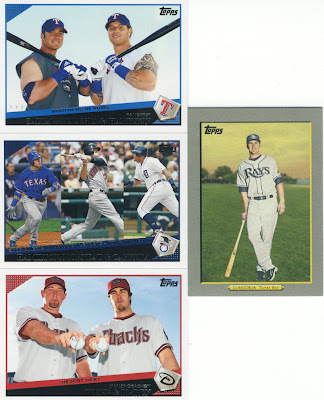 That Longoria card, by the way, .... ah nevermind. It's so sad because all I see in that last post in BBQ. God, I love food it's so sick. 1) Split screen cards like kind of cheap. No borders between the pictures or anything. 2) The Turkey Red cards, needless to say, look quite nice this year. 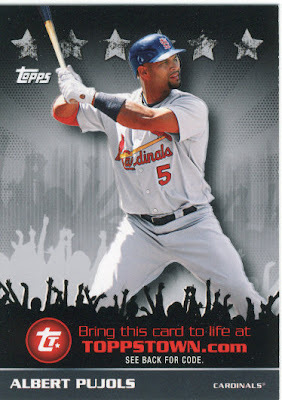 I still prefer the '08 Topps set, but I like this design better than '09 UD. Oh and thanks for posting all these pictures! Pictures of the back of the cards are up now. I can't wait to see Albert!!! Some pack, some day. 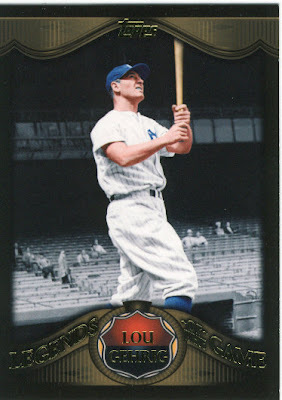 The back of the Gehrig card is fantastic.